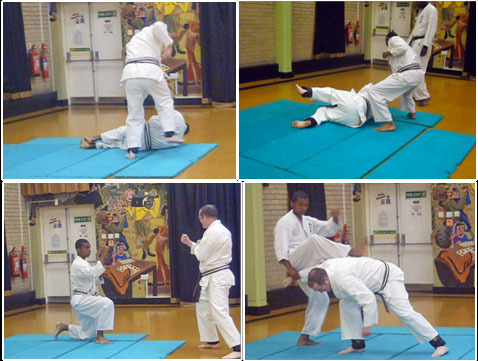 I never thought I would be learning Japanese, but that is what happened when I attended karate on Tuesday evening. I was greeted by Mike Beasley, who gave me the lowdown about what they do. 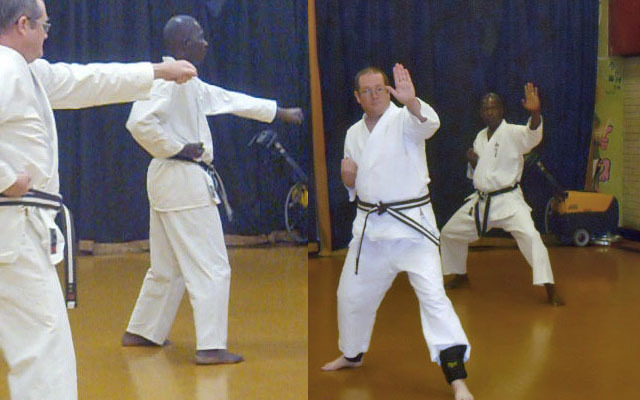 Mike is the 'Senior' of the British Traditional Karate Association, and the organisation runs several clubs around London as well as a number outside the capital. 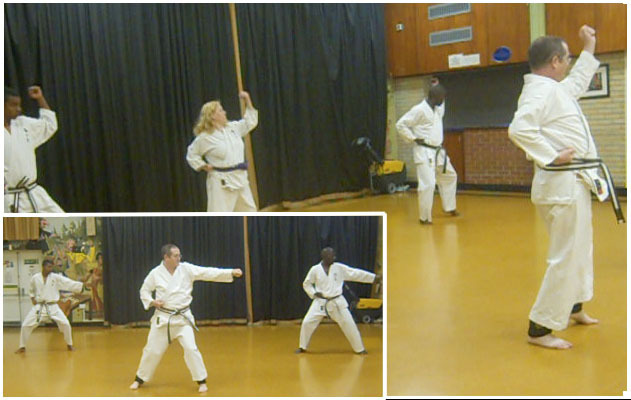 The class I went to was at South Mitcham Community Centre, where Mike has been teaching since 1996. 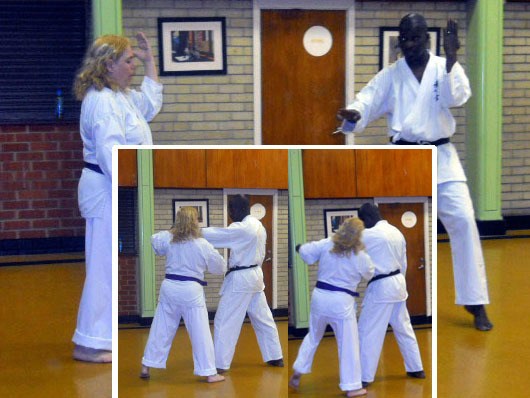 Alongside him are three other teachers, Diane, John, and Duncan, all of whom started off as white belts under Mike's tutorage back in the early days. Together, they teach students of all ages. The children's classes at the community centre are on Tuesdays between 6.30pm - 7.30pm. They are suitable for anyone six or over and costs £3 to attend. The adults' class is held directly afterwards and costs £4. There is of course the additional cost of the uniform, which Mike will provide if you give him the details. Belts are £3 and the training suit or 'gi' as it is called, is £15-£18 depending on your size. Weight straps make for a more challenging exercise. Although the classes are divided into child and adult, many of the children who reach a certain level graduate to train with the adults. This means that they can get the proper guidance appropriate to their skill level. Two of the students in class were teenagers with level one brown belts (there are three brown belts). Another level one brown belt I met was Adam, who was putting weight straps around his ankles to make things more challenging. John was teaching this particular class, and asked Adam to lead the group in their 'kata' routine. Kata is a series of solo movements or 'pinans' which are performed as if fighting an imaginary or invisible opponent; it is the equivalent of solitaire in a card game. There are five pinans for beginners, and more follow as you increase in skill. 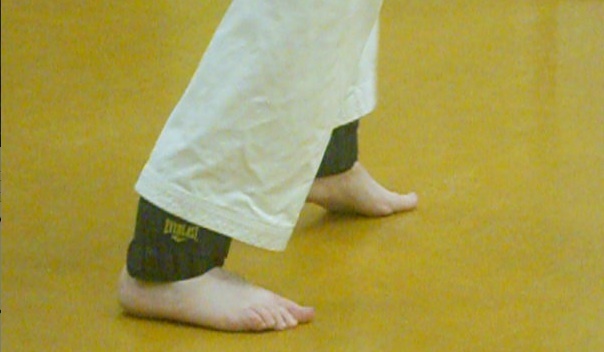 I learnt about three pinans that day: 'maegeri' (front snap kick), 'junzuki' (front snap punch), and 'gyakzuki' (reverse punch). I was rather bemused when Adam started shouting out strange words before starting: 'Ici, ni, san, oosa!' When I asked, he said it was Japanese and meant 'one, two, three, yes!' I suppose it is a bit like 'ready, steady, go'. 'Oosa' was a popular exclamation made throughout the evening, and seemed to spur everyone on. After the kata, the mats were laid out for 'oyo gumite'. This is pre-arranged sparring, in which the routine has already been choreographed, and it is your job to perform the movements correctly. It just so happened that I arrived the week before their grading exam, and this was part of the practice. Grading is when you are tested on different aspects of karate discipline in order to achieve the next belt level; it costs £15 to be graded. The question Mike asks everyone he meets is 'why don't you do karate?' And that is the question I will pose to you. It is a great way to learn self-defence, get fit, and have a good time.